I am currently working on a Rambling Rows afghan, which is knit up of squares and rectangles made from mitered corners. I love a good bit of mitered knitting! It can be used to create fascinating effects, seamless afghans, interesting stripes, and is easy to knit to boot. A "mitered corner" is a fold where the two halves meet at a perfect 45 degree angle. Imagine the way two sides of a picture frame meet at a corner. This pleasing geometry is easy to achieve in knitting. It looks best in garter stitch, both because the garter stitch rows show off the corner to its best advantage, and because the garter stitch helps to hide some of the imperfections that can otherwise come from the decreases. However, there are plenty of examples of wonderful mitered corners knit in stockinette, as well! Row 1: Knit to 2 stitches before marker, SSK, slip marker, K2tog, knit to end of row. Repeat this until you have only 2 stitches left, and bind them off. Now admire your lovely square! 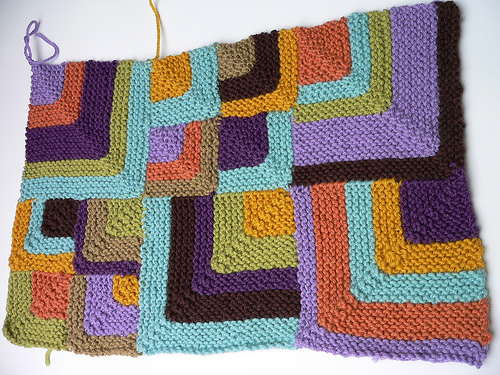 I have made some interesting projects by striping garter stitch mitered squares. Using two contrasting colors, knit two rows with each color. This gives you one garter stitch ridge per color. You can make a great afghan by either randomizing colors, or by using the same MC throughout, but choosing a different CC for each square. This is a fun way to make a lot of dishcloths. You can choose contrasting colors, or just knit the whole thing in one of the ombre shades. Either way, it's a fun and engaging way to crank out a simple square that might otherwise be boring. Start by casting on 100 stitches, and you should end up with a dishcloth of reasonable size. On Ravelry, I found a gorgeous mitered square blanket made entirely in Noro. This technique does wonderful things with self-striping yarns and yarns with long color transitions! There are a ton of patterns on Ravelry that use mitered squares, from afghans to felted purses to scarves, and even small decorative shamrocks! Ann and Kay of Mason-Dixon Knitting are probably the most prominent supporters of mitered squares, and even published a Mitered Crosses Blanket pattern to benefit the Red Cross tsunami relief fund.